Wargrave House is a Grade II listed building, the main structure of which dates back as far as the early 17th century. Much modified over the years, it has been associated with the medical practice since early in the 18th century when Thomas Cam Senior and Junior lived and worked in the building. The present practice began in the 1920s when Mr William Ainslie moved to Wargrave House, joined in 1926 by Dr Charles Walker. After World War II came Dr Stallard and Dr Schofield followed by Drs Davidson, Teal and Pimblett. Wargrave House is situated in the heart of Hereford. There is no parking for patients on site but there are several public car parks nearby. We have access for wheelchairs and prams to the rear of the building. Prams can be left in the conservatory extension. We have a toilet suitable for the disabled and baby changing facilities on the ground floor. 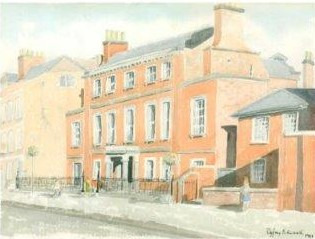 The picture opposite is a watercolour painted by Dr Dyfrig Edwards, partner at Wargrave House Surgery from 1972 to 2001.